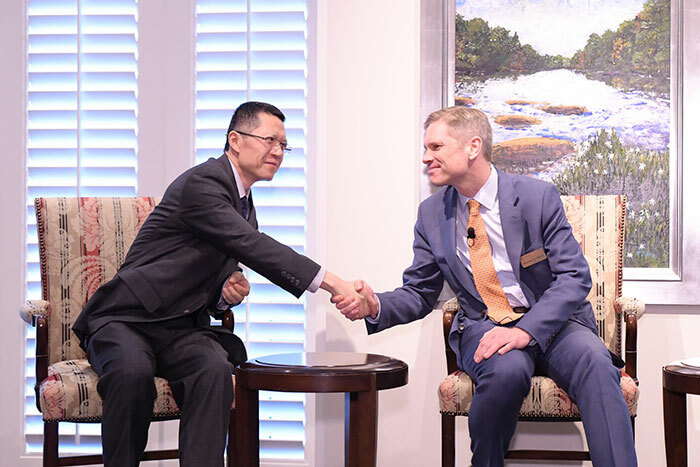 Emory College Dean Michael Elliott (right) greets Emory professor Tao Zha, research center executive director at Federal Reserve Bank of Atlanta, at the alumni event "Leading the Liberal Arts and Sciences: Spotlight on Economics,” held April 16 at Federal Reserve Bank. Zha, Samuel Candler Dobbs Professor of Economics, discussed the economy of China and its impact on the U.S. during the event, which highlighted the College’s strategic priorities and the partnership between Emory and the Fed. Paula Tkac (right), senior vice president and associate director of research for the Federal Reserve Bank of Atlanta, discussed economic forecasting factors during the alumni event. If a student wants to study macroeconomics in college, it would be difficult to find a better “real world” instructor than a Federal Reserve economist. Over the past decade, a dedicated group of faculty members in Emory’s Department of Economics has transformed a friendly but informal relationship with the Federal Reserve Bank of Atlanta into a robust, formal partnership that allows the department to attract top faculty and students and offer rare research, internship and learning opportunities — all while sharing costs between the organizations. Hashem Dezhbakhsh, chair of Emory’s economics department and Goodrich C. White Professor of Economics, says the collaboration has helped elevate the reputation of both organizations and positioned Emory Economics as an innovative and internationally-focused program. In the early 2000s, Emory’s economics department started a partnership with the Atlanta Fed to hire Fed economists to teach some undergraduate courses and occasionally hold joint events. 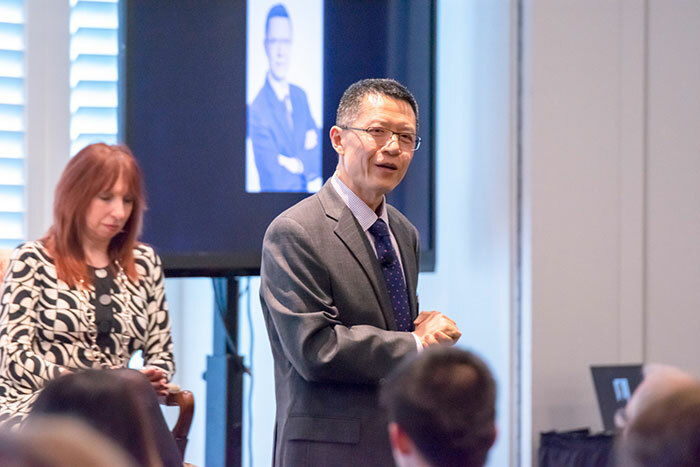 Then in 2008, Tao Zha, executive director of the Atlanta Fed’s Center for Quantitative Economic Research, accepted a secondary appointment on the Emory faculty as the Samuel Candler Dobbs Professor of Economics. Zha and leadership within the Department of Economics and Emory College of Arts and Sciences quickly recognized that the already successful partnership had the potential to do much more and were determined to strengthen the ties between Emory and the Atlanta Fed. Atlanta Fed leadership began working diligently with the Emory economics faculty to create synergies. The Atlanta Fed and Emory’s economics department now host a formal joint seminar series in macroeconomics, as well as jointly sponsored conferences and speaking engagements. The institutions are also poised to take advantage of joint recruiting opportunities when they arise, such as in 2014. That year, husband-and-wife economists Bin Wei and Vivian Yue joined the Atlanta Fed and Emory, respectively. Today, Emory’s partnership with the Atlanta Fed is one of the most productive in the country. Only a very small group of universities nationwide (University of Minnesota, University of Pennsylvania, Washington University in St. Louis) have such close collaborations with their local Federal Reserve Banks. Emory’s economics department now has seven faculty members who have a joint affiliation with the Atlanta Fed as visiting scholars and split their research time between both locations. Three to four Atlanta Fed economists teach courses at Emory each semester. Classes taught by Fed-affiliated instructors are very popular, Dezhbakhsh says. “It’s wonderful to have instructors who are working on projects with direct implications to our economy,” Dezhbakhsh adds. Federico Mandelman, a research economist at the Atlanta Fed, has taught macroeconomics courses to Emory undergraduate students for the past five years and says students are always eager to hear about his work at the Fed. And since ramping up Emory’s recruitment collaboration with the Atlanta Fed, the economics department has seen its number of publications, both overall and in prestigious economics journals, rise significantly. The department’s affiliation with the Fed has many other benefits for Emory faculty and students, particularly access to the Fed’s expertise and sometimes proprietary data through co-authoring relationships. “Partnering with the Fed, you have a larger faculty and more colleagues to collaborate with. In essence, you get a larger faculty,” says Juan Rubio-Ramirez, Charles Howard Candler Professor of Economics at Emory. Rubio-Ramirez, who joined Emory’s faculty in 2015 from Duke University with an affiliation with the Atlanta Fed, has also been very involved with Emory’s partnership with the organization. Academia allows macroeconomists time to explore underlying theories and experiment, while projects at the Fed often involve a practical focus. Being able to do both can be a pleasure and an advantage as a researcher, Rubio-Ramirez says. “For people who do macroeconomics, it’s very convenient to work with the Fed. Macro starts at the Fed — policies are discussed there and have their genesis there,” Rubio-Ramirez adds. For Atlanta Fed economist Mandelman, teaching a course at Emory each spring is a welcome addition to his full-time work at the Fed. The two organizations hold joint conferences and workshops several times a year, allowing each to split the cost. 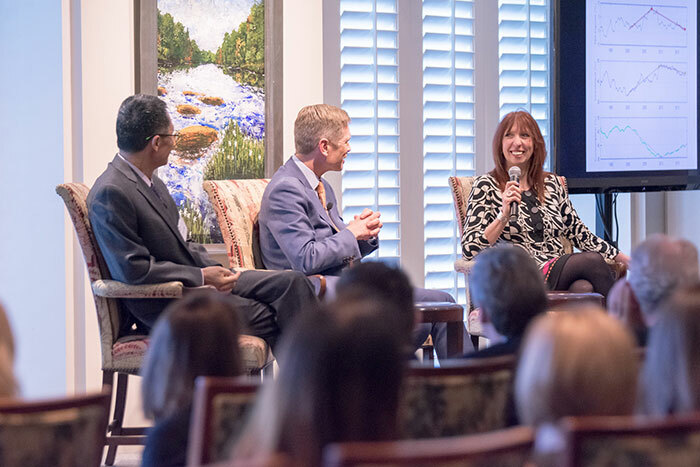 High-profile economists (recent speakers have included several Nobel Laureates) are also hosted by Emory or the Fed and members of both organizations attend, expanding the number of speakers that economists and students have the opportunity to hear. Emory economics faculty and students also have access to data from the Fed, through co-authoring relationships with Atlanta Fed economists. This is a rare opportunity, Dezhbakhsh says. As part of the partnership, Emory graduate and undergraduate students have interned or conducted research at the Atlanta Fed and report having great experiences. “I made some friends with diverse backgrounds at the Fed, and I really enjoy talking to them because they give me a lot of priceless advice — not only work-wise, but also about life,” says Jiaming Xu, a senior majoring in economics. She says doing research at the Fed encouraged her to pay closer attention to macroeconomics policies and news and to think about the policy implications of her own research and the research she studies. She’s now more comfortable with online research and data analyzing tools, she adds. Xu says the internship reinforced her passion for public policy and economics, and she’s decided to study economics and public policy in graduate school and focus her career on sustainable development and environmental policy. Anne Hannusch, an Emory PhD candidate in economics who worked with the Atlanta Fed as a research intern, says Emory’s Fed connections, especially joint events and her Fed research project, were extremely valuable. While Hannusch gained experience and connections, the Atlanta Fed also benefitted from her expertise and help with its research. Because the partnership has been a win-win for both organizations, it will likely remain very active and even deepen, Zha says. “I am confident the relationship is strong and will continue for years to come,” Zha adds.